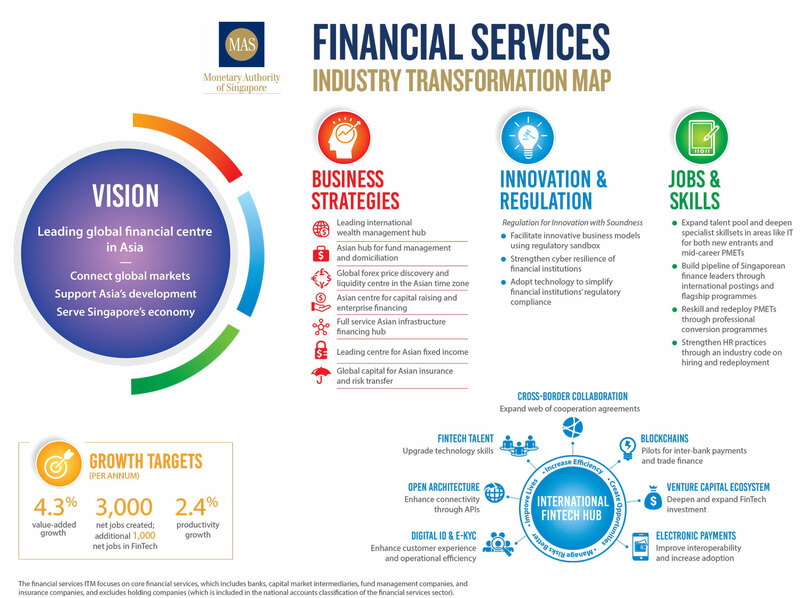 The Monetary Authority of Singapore (MAS) has just unveiled an industry transformation map (ITM) for financial services, which outlined growth strategies by business lines, programmes for upgrading skills, and an agenda for continuous innovation and technology adoption. Speaking at the launch of the ITM yesterday, Ong Ye Kung, Minister for Education (Higher Education and Skills) and MAS Board Member, described MAS’ vision for Singapore to be a leading global financial centre in Asia – one that connects global markets, supports Asia’s development, and serves Singapore’s economy. Drawn up by MAS in close consultation with the financial industry and the tripartite movement, the ITM aims to achieve three key goals – a 4.3% real value-added growth in GDP in the financial sector; a 2.4% annual growth in productivity; and the creation of 3,000 net jobs in financial services, and an additional 1,000 net jobs in the fintech sector annually. Minister Ong highlighted that the two big drivers of the financial sector in the years ahead will be macroeconomics and technology. Leveraging global and regional opportunities, by strengthening the country’s position in activities where it already has a strong competitive advantage. Embracing innovation, sharpening Singapore’s competitiveness and injecting even greater dynamism into the sector. Expanding and deepening the local talent pool in the sector. Minister Ong stressed that the challenge of talent and skills cannot be addressed by poaching which is often practised in the industry. Instead, for a long-term solution, Singapore has to leverage on a multi-pronged approach to expand and deepen its talent pool at a pace that can catch up with that of digitisation and automation which are re-defining job roles. Complementing the business strategies and innovation agenda outlined by the ITM will be an active SkillsFuture programme to help the financial sector workforce build world-class skills and maintain a strong Singapore Core. To enable more Singaporeans to compete for and take on regional and even global leadership roles, across financial institutions represented in the country today, MAS continues to support financial institutions’ management associate programmes, some including overseas stints, for over 800 Singaporeans since 2013. MAS has also supported Asian finance leadership programmes developed by SMU and NUS, which looks to deepen the finance leadership capabilities of senior finance professionals in Singapore, and provides a valuable platform for them to network with one another. To develop deep capabilities, MAS is working with the Ministry of Manpower and Workforce Singapore to pilot the Capability Transfer Programme, which supports the bringing in of international talent with specialised expertise and facilitates the transfer of capabilities to our local professionals. To build a local pipeline of specialised IT talent for the financial services sector, MAS is also working actively with institutes of higher learning, industry and IMDA. For example, it works with SMU on developing SkillsFuture training for the financial sector. To consciously codify and teach these capabilities, to enhance the indigenous talent pool and capabilities, MAS has worked with the Institute of Banking & Finance to establish competency standards in key job families across the financial sector. Understanding that these standards must translate into highly applicable training programmes, MAS has also co-funded training expenses of financial institutions – amounting to over $30 million over the past three years – to ensure that their staff acquire deeper competencies. 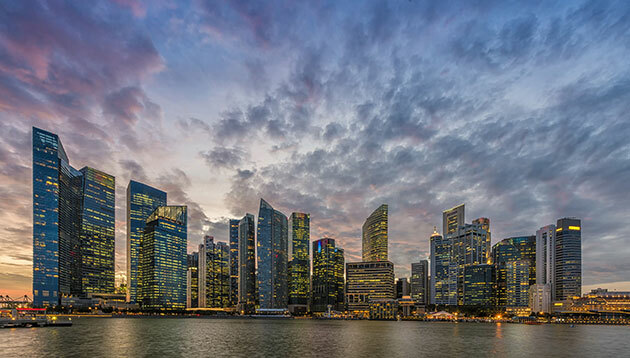 Amol Gupte, head of ASEAN and CEO of Citi Singapore, commented on the ITM, and why it is important for the industry: “The launch is timely and will further strengthen Singapore’s role as a financial hub in the region. The initiative complements the government’s policy to promote innovation and development of future skills capability. To expand the career advisory and job-matching services for the financial services sector, MAS is working with partner agencies to support professionals as they move across various job roles at different stages of their career. The career advisory services will also provide guidance on the training that financial services professionals will need, and help those displaced to enrol in PCPs or seek out new opportunities within or outside of the financial services sector.